Knighted in 2000 for his contribution in cancer research, Professor Sir David Lane (above photo) is internationally recognised for his original discovery of the p53 protein SV40 T antigen complex. The p53 gene is the most frequently altered gene in human cancer with more than half of all cancers having mutant p53. 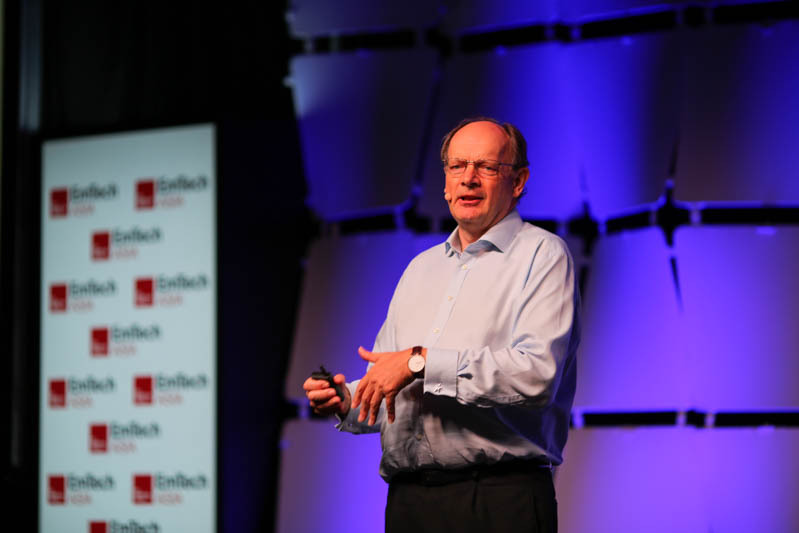 We spoke to Prof. Sir David Lane at EmTech Asia 2017 as he shared on his milestones as the Chief Scientist of A*STAR, ongoing research projects, working with industry and upcoming trends in cancer research. Could you share with us about some of the projects you are working on now? We’re working on projects related to development of new treatments for cancer and one of our major projects is trying to develop drug molecules that will activate p53. We’ve been working on this for some time but things are beginning to go very well. So that’s one big area. Then we have another area, which has been announced to the press with ASLAN pharmaceuticals on an antibody to a target called RON, which is overexpressed in tumours but also involved in immune modulation. That programme is now moving towards clinical trial. At the same time in the background, we’re always trying to do new things so a lot of work is trying to develop really new types of drugs that can attack targets inside the cell that have been difficult to treat with conventional drugs. Sometimes we call this undruggable targets but hope to make them druggable. Some of that work has been done in collaboration with MERCK pharmaceuticals and also with Ipsen. So it’s a very exciting area to work in, it’s a big challenge, so we’ve been using PEPTIDE type molecules, rather than conventional small molecules – it’s kind of a scale thing, so a typical drug is 500 molecular weight, a big antibody has a 250,000 molecular weight and we’re trying to get things to a 1000, 2000 molecular weight because they should be able to interfere with interactions that we can’t get at with small molecules. We sometimes call it a third class of medicine. If you want to put it simply, the big molecules are too big and the small molecules are too small. We think there’s a size in-between that would allow us to…if you look at current pill-like or small molecule drugs, they only target about 2000 proteins, there are 18000 protein targets that can’t be got at that way. And then antibodies, which is what we call the biologics, they work outside of the cell, we want to have molecules that have the kind of specificity of an antibody but go inside the cell so a lot of what we are studying is to make these molecules and how to make them go inside cells. How long have you been the Chief Scientist of A* STAR? What are some of the milestones/achievements thus far as the Chief Scientist? I first came to Singapore at the end of 2004 and I held a number of different positions at A*STAR. I started off as the Executive Director of IMCB and then I founded the Experimental Therapeutics Centre (ETC). I became the Chief Scientist in 2009, I think, so 8 years as the Chief Scientist. I think the setting up of the ETC was a very important milestone, we’re just about to celebrate the 10th anniversary – we started in 2007 and ETC has now produced 2 new drugs, both of which are in clinical trials. I think that’s a tremendous achievement, it wasn’t by any means my achievement alone, I started it off and a colleague, Alex Matter has taken over and done a fantastic job. So that’s one area I think. I also feel pretty excited about bringing Chugai Pharmaceuticals to Singapore, establishing the Chugai antibody research lab here- again we’re making wonderful molecules. Yup, those two things and other things as well. I guess it’s exciting to have a cohort of people you trained and see them going on to different and good positions. One of my trainees is now a patent lawyer, another one is working for BAYER and another one works for Illumina. You’re sort of feeling that a cohort of people you trained gets there, it’s good. Yes, I was well mentored myself by my PhD supervisor, Avrion Mitchson, everybody needs mentors, you know. So I’ve trained a lot of PhD students, had a lot of A*STAR scholars in my lab for a while so it’s definitely part of my job. You are a top-notch immunologist, molecular biologist, cancer researcher as well as an entrepreneur. How did your journey of combining research work and creating business begin? I got into the business aspect because I had this passion to take my research into the clinic, to really take it to the next level. So I did that partly and I still do it partly by collaborating with industry. I also realised that starting a business might be another way of doing it so I started a biotechnology company in Dundee, that’s still in NASDAQ, developing cancer drugs. I got a lot of inspiration from that and I think the business aspect comes really from the desire to see one’s work have meaning beyond just publication. I think I’ve always been passionate about that area. When I started in science, there was a sort of sense that you didn’t work with industry, that you’re a very ‘pure’ academic. I’ve never felt that, I always felt, “Look, if I’m gonna discover something, I want it to be tested and to have meaning”, so partly I like working with industry because it’s very rigorous. We have sometimes this issue in academic sciences that people can’t reproduce the finding but in industry, of course of you have to. Also, I like the fact that it’s a team of people working together, you’re not working for individual glory, you’re working for a kind of ‘end’, which is of course, ideally, immense and has an impact on peoples’ lives. So those things attract me very much. Fortunately for me, that kind of fits well in Singapore as well, because Singapore’s very interested in those areas and it’s been a good fit. What are your predictions and thoughts on cancer research and treatment in the next 3-5 years? Well, I think we’re in the middle of a very exciting period, I think the big breakthrough has obviously been the use of the immune system so we have these antibodies now, called the immune checkpoint inhibitors, they’re re-awakening the human immune system, that’s amazing to see. And I think we’ll see a lot more of that, its early success is so strong and there are many aspects of it as well. We’re beginning to understand more of these pathways. We’re beginning to engineer T-cells very well, so this T-Cell therapy or CAR T-Cell therapy is definitely important. A final thing is just people sequencing cancers much more deeply and finding out exactly what’s wrong in a particular cancer and finding out which drug it needs or which combination of drugs. We have, from a situation where we only had a few drugs – now we’ve got hundreds of different drugs so increasingly, you’re seeing this very personalised treatment. And some of the successes are quite spectacular, people who had 10 years after their treatment with no disease. This is very different when I started, you know, you treat somebody, they respond, resistance would come and the disease would have a pause but you never felt that you really made that kind of degree of difference. Now we’re seeing people that are really really ill be completely better, so, to me, is the most very exciting thing. I wasn’t even sure if I could see that. When we started, melonoma was a tumour that you never could…once it spreads it was almost impossible to treat and now we have many cases of people who were treated and 10 years later, they’re free of disease, I think that’s amazing. Who or what have been your greatest inspirations in moving you towards what you are doing now? My PhD supervisor as I said was a man called Avrion Mitchison, he was a wonderful scientist and great immunologist, he was a big inspiration to me. In Singapore, I’ve worked a lot with Sydney Brenner and Philip Yeo, both of them are very inspiring. A guy called Tom Blundell inspired me in terms of company founding, he founded Astex Therapeutics. I think you need mentors for different parts of your life, not always the same thing but examples of people who are very active and inspiring, I hope I do that to the young people. You need to give people confidence that they can do great things. You mentioned on the panel about ethics and cutting-edge research. What are your thoughts on managing ethics as well as handling potentially sensitive types of research? You really have to strike a balance, because it is complex, you have to weigh the benefits versus the costs very carefully. And then you have to be very accurate with the information you give people and I think you have to engage the public because one of the lessons we’ve all learnt is, if we don’t educate people properly then they can make decisions that are not good. Whether it’s a vaccine problem or political issues, it’s all the same- if you don’t give people good, honest facts and if you don’t explain them carefully in a way that they understand, then you could lose things that are very important to society. You have to put in the effort, I think sometimes everybody thinks that it’s somebody else’s job. How do you explain things to people in a way that is accurate and then they can make good decisions is very important. Because it’s not anybody’s right to make those decisions, they have to be made by societal consensus, they’re tough! You might ethically question, is it appropriate but where is the line? I mean when test tube babies came in, people thought it was terrible but now everybody accepts it. The questions of ethics is a very dynamic field which needs greater engagement of society as a whole to get the right answers. I think scientists should not escape their responsibilities to communicate because a lot of mistakes have happened historically. I think it’s a challenge but such an important one that one should give it study and effort, it’s a discipline in its own right. You think about the doctor’s consultation, often patients come out and they don’t really know what they’ve been told. I do think it’s an area we have to study, is it very good graphics, analogies or something else? Because a lot of it has got to do with understanding risk, you’re making choices, I think we’re not very good in communicating that to people. It’s hard as an individual person to get a sense of relative risk but the more we can understand that, the better.